Schengen visa sticker from Austria (1999) and Germany (2001) and one from USA (2000). 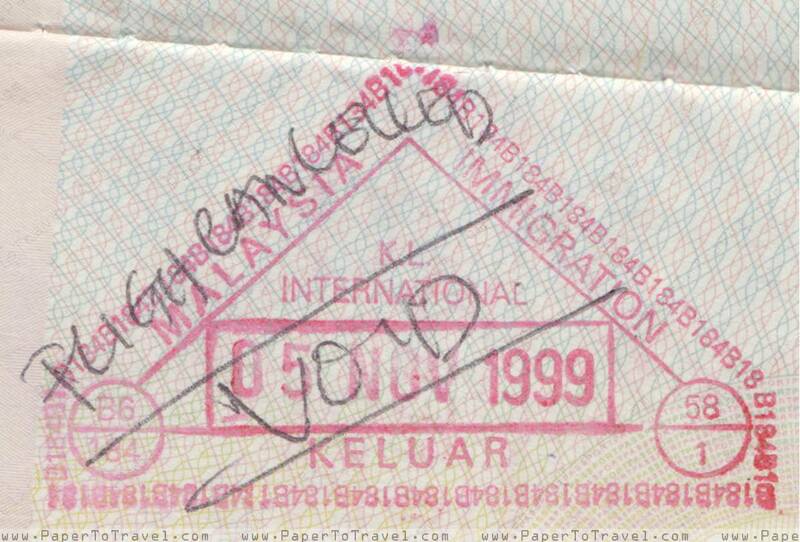 Immigration stampings from Malaysia (1999) and with voided exit stamp due to flight cancellation. It also has a number of stampings from Sarajevo (Bosnia), Austria, USA and Croatia. The Hina Croatian News Agency reported in March 1999 that BiH began issuing new passports in 1999 to comply with provisions in the Dayton peace agreement that all citizens of BiH should have equal passports (2 Mar. 1999). The new passports also meant that citizens of the Republika Srpska would no longer require a visa to enter neighbouring Croatia (Hina 2 Mar. 1999). Hina reports that the new passports would be valid for a period of 5 years (Hina 2 Mar. 1999; BiH 1999, Art. 29), although passports for persons under 16 years old are valid only for 2 years. First two (Pasoš and Putovnica) which were given to people who declared themselves as Croats or Bosniaks (or the language they prefered). Bosnia and Herzegovina's 1999 Law on Travel Documents describes the 32-page passport (BiH 1999, Art. 8) as dark blue in colour, with the title Bosnia and Herzegovina and the country's Coat-of-arms on the cover (Art. 6). The passports indicated on the cover which part of the Federation's constituent the bearers were citizens of, either the Bosnia and Herzegovina or the Republika Srpska. BiH began issuing new passports in 1999 to comply with provisions in the Dayton peace agreement that all citizens of BiH should have equal passports. The new passports also meant that citizens of the Republika Srpska would no longer require a visa to enter neighbouring Croatia. Hina reports that the new passports would be valid for a period of 5 years, although passports for persons under 16 years old are valid only for 2 years. The new coat of arms of Bosnia and Herzegovina was adopted in 1998. Previous coat of arms was viewed as medieval symbol that represented Bosnianks so Serbs wanted it to be changed. The current coat of arms of Bosnia and Herzegovina presents the typical straight top, oval sides, and spiked bottom. The coat of arms has two background colors, dark blue and gold. Both colors are seen in the coat of arms between 1992 and 1998. Even though the current coat of arms does not directly relate with Bosnian-Herzegovinian history, the colors that were used were the ones from the former coat of arms. The top right corner forms a yellow triangle symbolizing the shape of Bosnia and Herzegovina, with the blue covering the remaining portions of the flag portraying the sky, rivers and lakes. A travel document is a public document proving identity and citizenship of Bosnia and Herzegovina and Citizenship of the Federation of Bosnia and Herzegovina or Republika Srpska. A citizen of Bosnia and Herzegovina [hereinafter: "citizen"] shall be entitled to have a travel document under the conditions provided by this Law. Travel documents are: Passport, Diplomatic Passport, Service Passport, Group Passport and Travel Certificate. A Citizen may possess only one travel document of the same kind. the words "Republika Srpska" in italics if the bearer of the Passport is citizen of Republika Srpska. 3. The text of items a), c) and d) shall be printed in the Bosnian or Croat language for passports of Bosnia and Herzegovina issued to persons mentioned under d), as chosen by the applicant for the passport. The text of items a), c) and e) shall be printed in the Serb language for passports of Bosnia and Herzegovina issued to persons mentioned under e). Items a) and c) shall also be printed in the English language. 4. The text of the first page of the Passport shall be identical to the text of the front cover. "This Passport contains 32 pages." Law on Citizenship of Republic of Srpska (1999) and the Law on the Citizenships of the Federation of Bosnia and Herzegovina (2001). Both entity laws equally provided that citizens of the entity ‘are thereby citizens of Bosnia and Herzegovina’. Entity citizenships are primary, while the state citizenship is derivative.